Several years ago during a wine tasting tour of Tuscany and Umbria we bought an incredible bottle of Amarone. We have saved it over the years for a very special occasion. When we bought our Casa in Loreto over three years ago we agreed that we would celebrate our new home with that treasured bottle of wine. 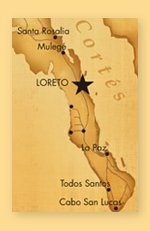 Gourmet experiences in Loreto are not an everyday occasion. 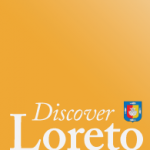 There are good restaurants in Loreto. But Loreto isn’t epicenter of haute Mexican cuisine. We were thrilled when we heard about Felipe Iñiguez Salcido. 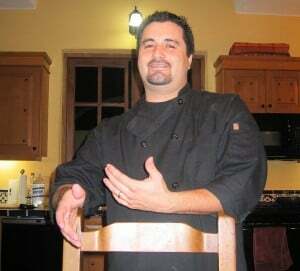 Felipe is an experienced cook who is influenced by his extensive culinary experience in Barcelona Spain and elsewhere. More importantly, his cooking style is inspired by the Mexican northwest grill techniques of his childhood and the central Mexico kitchen styles that have been passed through generations in his father’s family. Felipe cooks in your home and serves a meal that would rival great restaurants anywhere. He worked with us on a menu that would pair well with the Amarone. Felipe suggested duck or lamb with accompanying dishes all designed to enhance the Mediterranean influence of the evening. 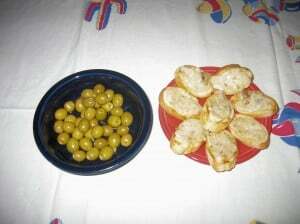 We began with a wonderful pair of tapas which included a baked brie crostini with nuts and rosemary paired with a dish of Spanish olives. What a nice start to the evening especially when sampled outdoors along with Margaritas and Mezcal. We went inside for the first course. Felipe served crisp, flash sautéed green beans with garlic and seared prosciutto topped by freshly grated parmesan cheese. The combination of the crisp beans with the pungent garlic and pork was a perfect primi for the more robust course that followed. Next, Felipe presented a wonderful roasted duck with red wine mushroom sauce graced with a hint of garlic. It was perfect with the Amarone. The duck was full flavored and the accompanying sauce excellent. And paired with the wine, heaven! A simple side of al dente potatoes drizzled with salt and olive oil was an excellent accompaniment. For dessert, he served a light cheesecake covered with fresh berry compote. This meal was simply delicious. We waited several years to have this celebratory meal in our Mexico home and we were not disappointed. 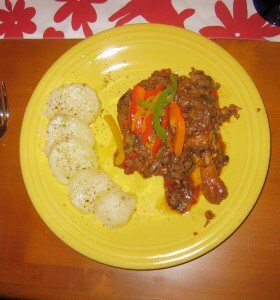 We look forward to inviting Felipe back for many more gourmet feasts at Casa de los Gallos!